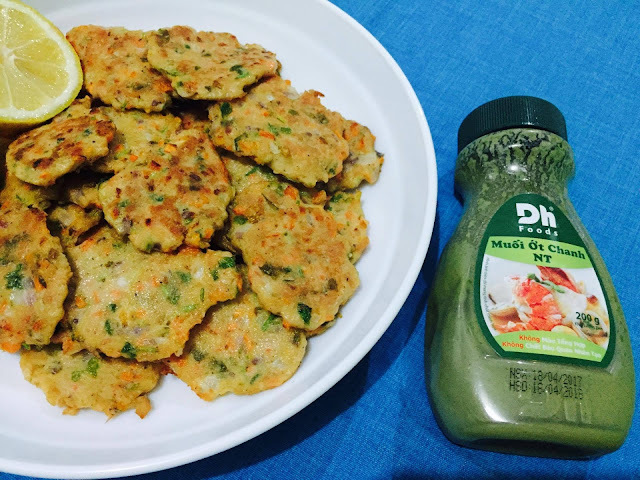 One of the food that I missed eating when we went to Ho Chi Minh was Cha Ca Quy Nhon or Vietnamese Fish Cakes. And because I've been craving for it and I am not really sure if the Vietnamese restaurants here in Manila has it on their menu, I decided to recreate some in my kitchen. I did tweak the recipe a bit and used canned tuna instead of fish fillets. This recipe of Vietnamese Fish Cake or Cha Ca Quy Nhon is very easy to do. 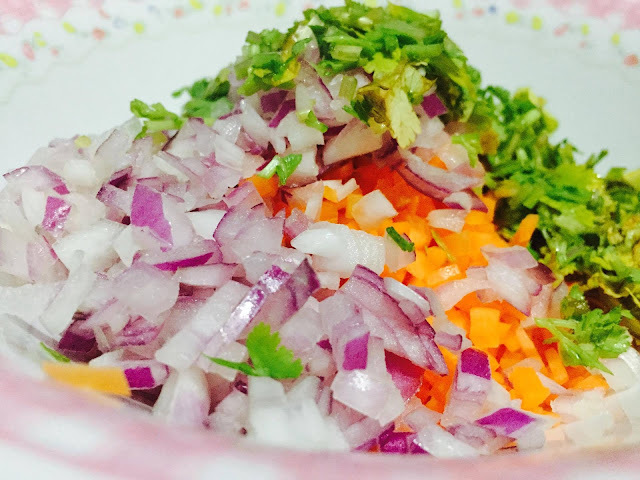 So here's how I minced the onion, carrot and wansoy. Really, really small pieces. Then I drained the tuna from its oil. I was thinking of using that oil for frying but decided against it since it will taste better with fresh oil. 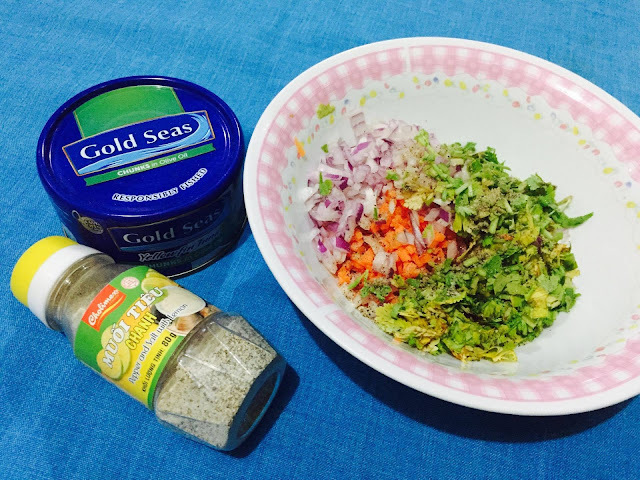 Mashed the tuna in the minced veggies and add the salt, lemon, and pepper powder. If you don't have the powder, simply squeeze the lemon juice (or lime) on the mixture, add salt and pepper to taste. Then add some flour and the eggs, mix well until you can form a soft ball. Heat non-stick pan and add some oil. Scoop a tablespoon of the fish batter unto the pan and flatten it with using the spoon, turn when golden brown. 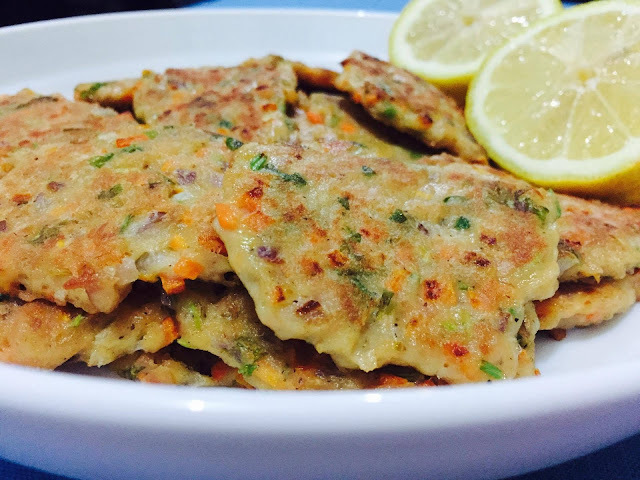 Or if you are in a hurry, you can make a larger fish cake. Serve with Muoi Ot Chang or Salt, Pepper and Lime Dipping Sauce. I got mine from Ho Chi Minh. Actually, the fish cakes are tasty already and I just squeezed some lemon to enhance the taste better. My hubby preferred Sweet Chili Sauce though. Do la thoi gian de an (Its time to eat)! I would like to try this recipe and check if my boys would love this. Seems like a nice baon for the boys, too. I need not worry about sauces that may spill. But would love to try this one, was it really recommended to use the Gold seas tuna chunks, or regardless sa brand? I'm not great at cooking so I always look for recipes with easy instructions like this. lol. I'm not too familiar with some of the ingredients but I'm pretty sure they are available in the grocery store. I bet this one tastes good! If you will use the lemon or lime, that's readily available in the grocery. As for the Vietnamese powders that I used, haven't seen one here in Manila. Yeah, one of the latest tuna brand. This brand is not as oily as the others though.. or maybe its because of the olive oil; not really sure.